On a recent webinar, several people asked me if I would be willing to share some of my favorite handwriting fonts. Of course, I find it hard to decide on just a few fonts to be my favorites, so instead I’ll show you a lot and let you decide for yourself! Handwriting fonts can be used to help you achieve a personal, informal feel on your designs and web pages. They also provide a means to break up monotonous Arial, Times or other standard, boring fonts and can grab a visitor’s attention which can be important on squeeze pages, sales pages, etc. Now with literally hundreds if not thousands of handwriting fonts available, choosing the right one comes down to being more about the emotion and style that you are trying to elicit (IE, don’t use girly handwriting for a weight lifting site, but a sloppy, strong handwriting style could work perfectly) than picking one favorite. Although, if you do find one that works for everything, then that’s cool too. Effective usage is based on achieving the correct balance as some fonts can be very hard to read, while others are borderline computer style. 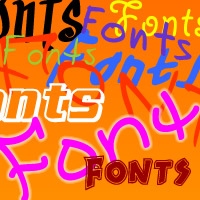 You might be surprised to learn that I find all my fonts in one place. Throughout the years, there have been many good free font sites, but none that I have found even come close to 1001FreeFonts. I’m actually amazed at the amount of stuff there, you could really never use it all, but always find exactly what you need for the job and the thing is, the site is not hardly monetized so help them out if you feel so inclined. Go get some handwriting fonts at: http://1001freefonts.com/handwriting-fonts.php and then let me know what your favorite is! Thanks for the great tip. I’m always looking for good text for my sites including handwritten fonts. Thanks for sharing great valuable information brother.